VVS diamonds are one of the highest clarity grades for diamonds. Clarity is important for the brilliance, sparkle and 'fire' of a stone. However, there is an incredible intricacy involved throughout the whole process of creating a perfect piece of jewelry. From mining, cutting, and finally fitting into a ring or other jewelry piece, there are countless considerations, nuances, and choices to be made. VSS diamonds are guaranteed to be spectacular diamonds in their own right but clarity is just one of several factors that determine the quality of a diamond. This article will provide detailed information on VSS diamonds and other clarity grades. However, for the sake of perspective we will first briefly cover the other three important grades for diamonds. If you are already familiar with cut, color, and carat, skip down to the clarity section to learn about VVS and other diamond clarity grades. 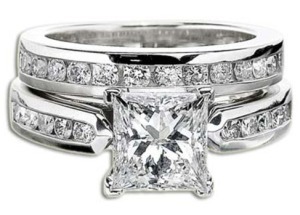 You can then design your own VVS diamond ring directly on the site. Jewels and diamond distributors throughout the world grade diamonds based on four standard scales or criteria known as the 4-Cs of the diamonds. These 4 Cs are Cut, Colour, Carat, and Clarity. It is nearly impossible to find (or afford) a diamond that is perfect for every respect. The points of compromise will always be up to the individual buyers. For example, would you want a clear and large diamond but with a slightly yellowish color or perhaps sacrifice on the carat weight? Whatever stone you end up choosing and however important the occasion, always keep your budget in mind. As mentioned above, VVS diamonds are a 'nearly perfect' grade on the clarity scale but in order to put the VVS diamond in perspective, this article will first briefly cover each of the four Cs of diamonds, ending with a more extensive evaluation of clarity. Diamonds are not quite literally cut. It is more like they are cleaved and polished to achieve the desired shape, size, look, and most important, optical reflective qualities. Diamonds can be cut into many different shapes such as the most common round brilliant, princess cut, pear shaped, or marquise diamond cuts. In additional to overall shape, a diamond cutter attempts to reveal three hidden qualities of every diamond. These optical qualities are reflection, refraction, and scintillation. Diamond scintillation is the life and fire of the stone, the way it flashes in the light as the wearer or viewer move. To a lesser extent, these optical qualities are also assisted by a high clarity grade. Diamond cutting is an extremely precise and complicated art and usually the most important consideration when buying a loose diamond. Color is the second 'C' of diamonds. The color of the diamond is also important and, excluding fancy colored diamonds like a chocolate diamond or canary diamond, stones that are closer to colorless or 'white' are generally more desirable. The natural color of diamonds range from colorless (D-E-F) to near colorless (G-H-I-J), then faint yellow (K-L-M), very light yellow (N-O-P-Q-R) and light yellow (S-T-U-V-W-X-Y-Z). The third 'C' of diamonds is carat. Carat is a unit of weight where 1 carat = 200 milligrams. Carat weight will loosely corresponds to the 'size' of the diamond but size (and shape) will also depend on the stone's cut. As large rough diamond stones are very rare, as carat weight increases, the stone's value increases even faster so for example, a 2 carat diamond will be well over twice the price of a 1 carat diamond. In general, The bigger it is and higher the quality, the more expensive the stone will be. FL Diamonds – Flawless diamonds do not have any imperfection on the inside or outside. These extremely rare stones are perfect and the highest grade of clarity possible. IF Diamonds – Internally Flawless diamonds do not have inclusions inside. The surface may have a minor blemish when viewed under high magnification but for all intents and purposes, IF diamonds are identical to FL diamonds so IF and FL are considered on the same grade of clarity (#1). VVS Diamonds (VVS1, VVS2) – Very Very Slightly Imperfect diamonds have very small inclusions in them which invisible to the naked eye and even very difficult to see under 10X magnification. VVS1 diamonds are of slightly higher clarity grade than VVS2 diamonds but at 2rd place, VVS diamonds in general are very high clarity stones. VS Diamonds (VS1, VS2) – Very Slightly Imperfect diamonds have small inclusions that are more numerous or larger than VVS diamonds. However, as with VVS diamonds, the inclusions or blemishes in VS diamonds are extremely minor and usually not visible to even the sharpest unaided eyes. VS1 diamonds are slightly higher clarity grade than VS2 diamonds. According to the AGS (American Gem Society), on a clarity scale of 0 through 10, 0 is a flawless diamond (FL/IF) while VVS1 is marked as 1 and VVS2 is marked as 2. SI Diamonds (SI1, SI2) – Slightly Imperfect diamonds have inclusions that are easy to see with 10X magnification and under very close inspection are often visible to the naked eye (although just barely). SI diamonds remain brilliant and stunning but can be considerably less expensive than VS or VSS diamonds. In general, a very good choice for budget conscious buyers who still want a great looking stone. Imperfect Diamonds (I1, I2, I3) – Although small, the inclusions in these stones will always be visible to the unaided eye under close inspection. Although still diamonds, and still brilliant and flashy, these are the lowest clarity grades and most high-end diamond and jewelry retailers do not even carry jewelry or loose stones of imperfect grade diamonds. As with the other grades, I1 diamonds are better than I2 diamonds, which in turn is above the I3 diamond. VVS diamonds are the second best grade for diamond clarity but don't let this fool you. To the naked eye and to anyone except a diamond expert with a powerful microscope, these are already perfect diamonds and indistinguishable from flawless. The imperfections of the VVS diamonds can only be spotted by an expert's eye under a microscope. Possible characteristics of a VVS diamond could be a microscopic internal spot or spots outside the table, a small crystal below the facet edge, a slightly rough facet edge, or possibly one or two slightly larger cut facets. VVS diamonds are superior diamonds of high value and some of the most expensive diamonds available in the market. For a momentous life-changing event like a wedding engagement or anniversary, some couples want an equally significant diamond to commemorate the occasion. For all practical intents and purposes, VVS diamonds are as perfect as a flawless diamond yet they are priced well under flawless. Although VVS diamonds are uncommon, they are considerably more common than actual flawless (FL and IF) diamonds. For a higher carat stone, the difference in cost between a flawless diamond and a VVS diamond can be several thousand dollars or more. This is why, whether for your engagement ring, an anniversary, or simply a splendid gift, VVS1 and VVS2 diamonds are the smart choice for anyone seeking a perfect high end diamond.